Within months of the Union victory in the Civil War in 1865, a small band of soldiers from the defeated Confederate army gathered in Pulaski, Tennessee, and formed an organization they dubbed the Ku Klux Klan. Very quickly, like-minded individuals—mostly professionals and former plantation owners—joined what was initially a loose network of chapters throughout much of the South. Their primary focus was to oppose Reconstruction, and to that end the KKK launched a campaign of terror in which its members killed thousands of blacks who worked with poor whites to build a new South. That campaign culminated in the complete defeat of Reconstruction with the Hayes-Tilden Compromise in 1877. In the 150 years following the founding of the Ku Klux Klan, additional organizations using some variation of that name sprang up. The former Confederacy was always the base of the various Klans, but when the KKK experienced a dramatic revival in 1920, chapters emerged in northern and western parts of the United States as well, including in Connecticut. The remarkable increase in Klan popularity—its membership reached five million during the 1920s—came largely from its branding itself as nativists defending an embattled pure American white race against blacks, Jews, Catholics, Bolsheviks, and immigrants who came to US shores in large numbers in the preceding two decades. Always, though, the Klan’s primary animus was toward blacks. The first reports of individuals in the ubiquitous white robes gathering in Connecticut, as well as of cross burnings (a telltale sign of an organized Klan presence) in the state, date to as early as 1924. The Klan regularly organized field days, and one held in Greenwich in 1928 attracted 200 people. One estimate placed the Klan’s peak membership in Connecticut in the 1920s at 18,000. The KKK declined in Connecticut as dramatically as it rose, however, and its membership by the 1930s was a fraction of its peak. 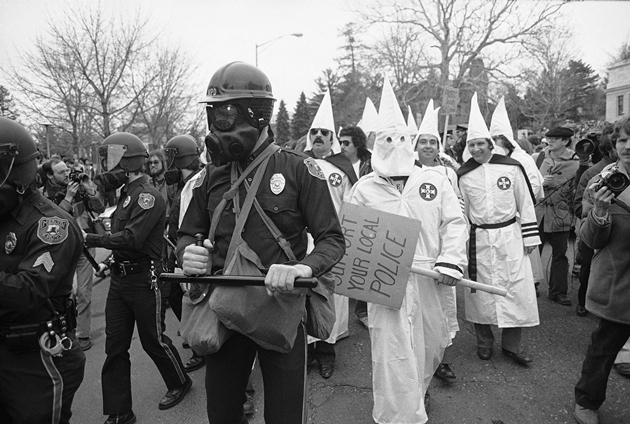 Klan activity in Connecticut proved virtually nonexistent for five decades until the early 1980s when the Invisible Empire of the Knights of the Ku Klux Klan, one of a myriad of splinter groups, formed. The Invisible Empire established a chapter in and around Meriden and held a series of actions in that part of the state over the next two years. 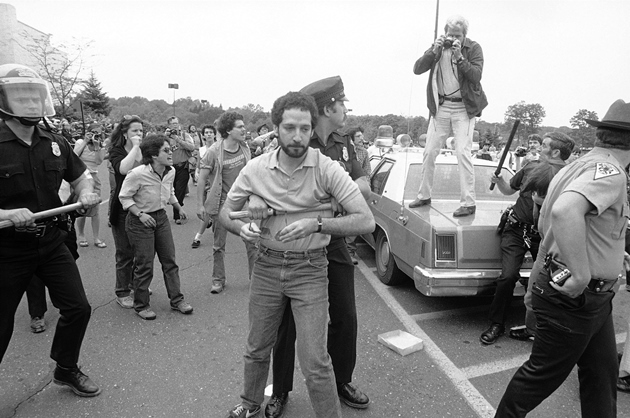 The most dramatic of these actions was on March 21, 1981, when several dozen robed Klan members and supporters rallied at Meriden’s city hall in support of a Meriden police officer who shot and killed a black man suspected of shoplifting at a nearby mall. A far larger number of anti-Klan demonstrators (throwing rocks and bottles) met the Klan members, resulting in injuries to 20 people and the arrests of two counterdemonstrators. The KKK held rallies in Meriden on July 4, 1981, on March 20, 1982, and on April 30, 1983, and also in Windham on October 10, 1981, that attracted as many as 30 members and supporters. On each occasion, however, crowds 10 to 20 times larger gathered to protest their presence. The Invisible Empire also set up the Klan Youth Corps, a group for young supporters, and leaflets published by the Corps began appearing in high schools in the Meriden area around this time. Questions from students prompted the union representing many of the state’s teachers, the Connecticut Education Association, to publish a curriculum guide about the KKK. The same article estimated that the Invisible Empire had 200 members in Connecticut in 1982. Though the Klan’s public presence in Connecticut soon waned, it resurfaced at various times over the next three decades, mostly in the form of flyers attributed to one faction or another. Such flyers appeared in Orange in 2012 and Milford in 2013. According to a report issued in 2014 by the Southern Poverty Law Center (SPLC), there remains one Klan faction in Connecticut: the Loyal White Knights of the Ku Klux Klan. According to its website, the Loyal White Knights are based in North Carolina and are “the largest Klan in America.” Neither the Loyal White Knights nor the SPLC provide estimates on how many members or chapters the Knights have in Connecticut, where members and chapters reside, or provide any insight into member activity. “7 Are Injured by Rocks as Connecticut Rally by Klan Is Broken Up.” The New York Times, March 22, 1981, sec. N.Y. / Region. Link. 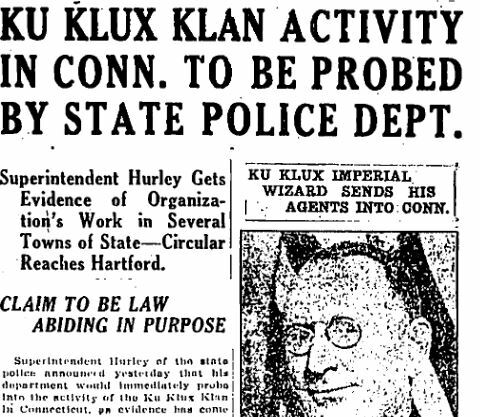 “Ku Klux Klan Activity in Conn. to Be Probed by State Police Dept. : Superintendent Hurley Gets Evidence of Organization’s Work in Several Towns of State.” Hartford Courant. September 3, 1921. “Ku Klux Klan in Monster Meeting Near New Haven: Statewide Gathering Beneath ‘Fiery Cross’-- All Cities in It.” Hartford Courant. May 21, 1922. “Ku Klux Klan Is Well Organized in Hartford: Knights of Invisible Empire Work Quietly in State for More Than Year.” Hartford Courant. May 23, 1922. Muth, Mark. “The Klan.” The Christian Science Monitor, March 18, 1982. Link.